This Sunday, April 10, 2016, salons in Boston are joining with salons across the country in the 7th Annual HAIRraising Cut-a-Thon raising money for Boston Children's Hospital Heart Center. All the proceeds will go to the Heart Center. Click this link to find a participating salon near you to join the fun and get a great hair cut!! Some of the salons are also running raffles to raise more money. Marisa Marino, the owner of Stiliste Salon on Newbury Street, Boston, MA, heard that I make Waldorf type dolls. She asked if I would make 2 dolls to raffle for HAIRraising. Of course! To the right are photos of the 2 dolls being raffled. 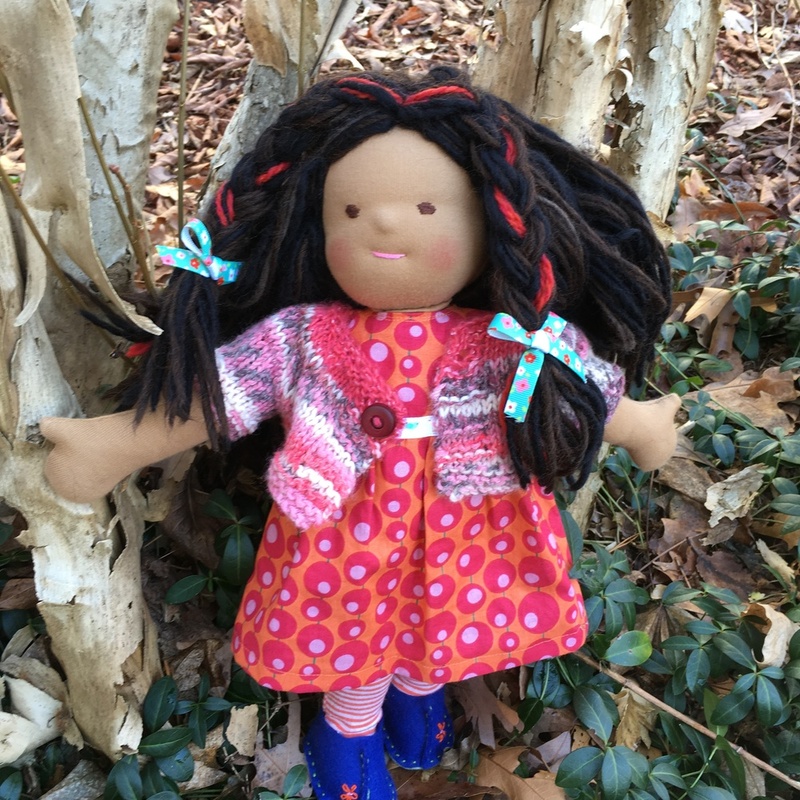 Each doll is 15 inches tall and is wearing a dress, hand knit sweater, felt clogs, underwear and tights. (See right side bar for more information about the dolls and the clothing). If you would like to purchase a raffle ticket for a doll, call Stiliste Salon at 617-262-2234 through the month of April, 2016. Ask to speak to the receptionist when you call and tell her you want to buy a raffle ticket for a doll. Good luck if you join the raffle. And thanks!! It's for a great cause. Doll: 15 inches tall. The doll pattern is my own design, based on typical Waldorf-type dolls. The skin is 100% cotton knit fabric imported from the Netherlands. The stuffing is virgin wool roving. Hair is wool yarn. Safety: They are only for children age 3 and older. The doll may be spot cleaned or hand-washed in wool friendly soap. Rinse and air dry. Do NOT wash in a washing machine or put in a drier. The doll's yarn hair may get some felting with love. This is normal wear.